It’s Ardenne week, the final week of one-day races before we focus our attention on the GC riders and the 100th Giro. First up (well, second up really, but we were enjoying our Easter eggs a bit too much and missed Amstel Gold) we have La Flèche Wallonne, The Arrow of Walloone. This is a race about one climb. That may sound simplistic, but in reality, the race before the final 1.3km ascent of the Mur de Huy is about positioning, having your team mark any attacks and keeping the break on a tight leash. The first 127kms of the 204km race undulate across the Ardennes, sapping the legs and allowing a few riders the opportunity to furrow a lead before the punchy stuff begins and their advantage is quickly reeled back in. 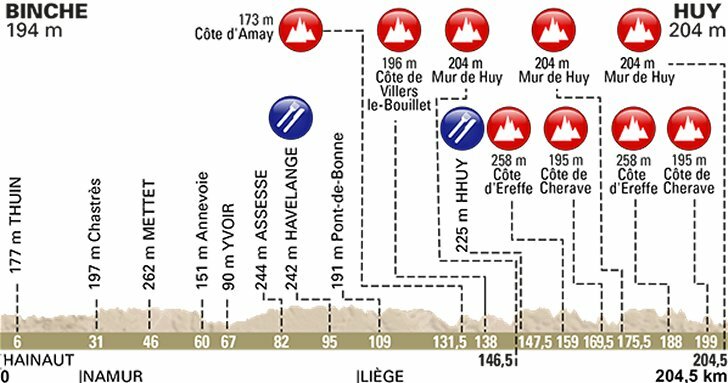 The first climb of the day is the Côte d’Amay, which is closely followed by Côte de Villers le Bouillet. Then the riders hit the Mur for the first time at 141km, they will scale it a further two times. This first ascent also marks the beginning of a two lap circuit around Huy. The Côte d’Ereffe is tackled first and then the Côte de Cherave before being greeted by the Mur for the second time, which will leave just under 30kms to go and one final lap to complete. 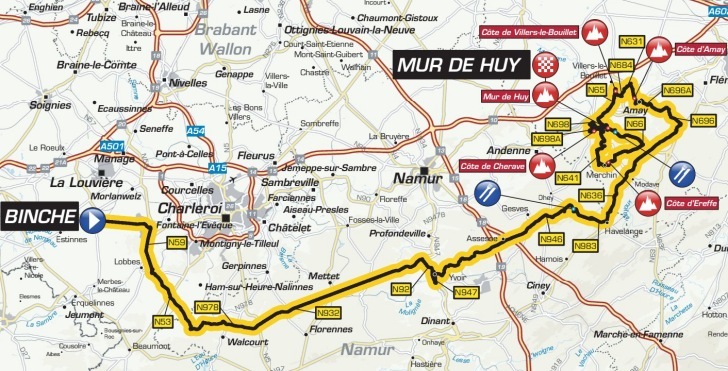 The pace on this final circuit will ramp up, and expect to see the likes of Tim Wellens and Bob Jungels show their hand with an attempt, or attempts, of a late attack before the race reaches its crescendo on the third and final climb up the Mur de Huy. The climb is only 1.3km long and starts relatively easy, however with 900m to go the gradient jumps up to 11%, 17%, back down to 14% with the final 100 metres a mere 6%. It’s this intense middle section where the winning move, or rather the final move no one can match, will be made. It’s a race that has ended in the same way for thirty-one years and we can’t see that changing this year. Alejandro Valverde is King of the Mur de Huy. He completed a hat trick of wins whilst also taking his fourth win here last year and judging by his current form so far this year, which has seen him win the Ruta del Sol, Volta a Catalunya and Pais Vasco, he will start as the favourite once again. Unfortunately, injury has taken out two of his nearest challenges. Julien Alaphilippe was ruled out with a knee injury and another golden oldie, Phillipe Gilbert, damaged his kidney in a crash on his way to winning Amstel Gold. The man he beat in that race, Mikel Kwiatkowski, should be the man to challenge Valverde, The Polish rider has been in great form himself this year, after a poor first season with Sky in 2016, taking Strade Bianche and Milan San Remo. Sky also come here with Paris-Nice winner, Sergio Henao who was sixth at Amstel Gold and will be a back up option for the team. With Alaphilippe ruled out, Dan Martin will lead Quick Step. He looked in great form during Catalunya but was a DNF at Amstel Gold. He has been in the top four on the last four occasions of this race and will desperately want to reach that top step, however its hard to see him out ‘sprint’ Valverde on the Mur de Huy. Quick Step also has some decent backup options in the shape of Brambilla, Jungels and Vakoc. Rui Costa has shone in his new UAE Emirates team colours, winning their home race The Abu Dhabi Tour and a strong showing at the Tour of Oman. However, in recent weeks, he hasn’t reached that peak again. He finished low down at Amstel, arguably focusing on this race with an aim to better his best finish of tenth from last year. Michael Albasini was third at Amstel and was seventh here last year. Despite a strong team around him to support him, a top five seems the best outcome for him, with Liège–Bastogne–Liège on Sunday more suited to him. Cannondale Drapac have been the nearly men so far this spring, with strong showings during the cobbled classics and week long stage races. Rigoberto Uran botched a numerical advantage to loose stage five at Pais Vasco, but he and his teammate Micheal Woods have worked well together and could do so again here. Expect the Canadian to go early on in order to draw out a move. Our dark horse bet would be Jarlinson Pantano, he hasn’t raced since he was beaten on the line by Valverde in Barcelona for the conclusion to the Volta Catalunya – we’re hoping that he’s bottled up that open display of anger and disappointment ready to unleash it on the final ride the Mur! Other riders to look out for are Alexis Vuillermoz, Nathan Haas, Jay McCarthy and Ben Hermans. Our Pick: We’re not going to go with the most obvious pick and instead say that Mikel Kwiatkowski will end Valverde’s winning streak on the Mur de Huy and pick up his third one-day win of the season.